1. Adequacy of dystrophin creation. FDA had little faith in early dystrophin measurements due to the single lab processing of tissue samples and perceived sloppiness of assays conducted. After much back and forth, a new agreed upon method was deemed satisfactory to FDA for detecting the protein and used in the 180 week biopsies. 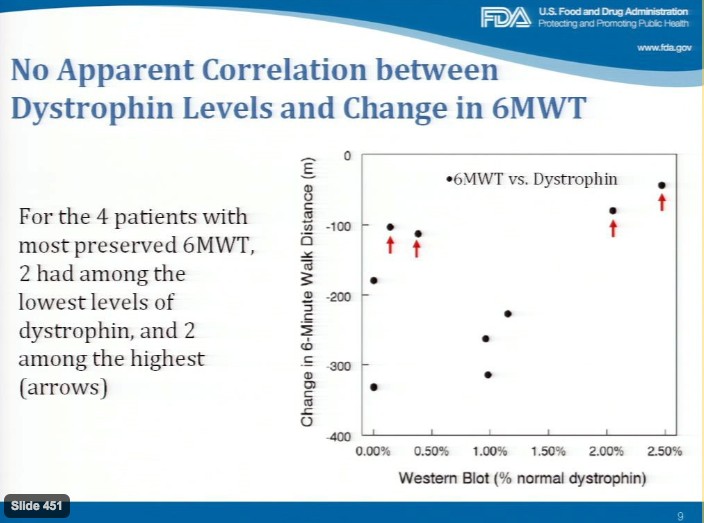 The question was then whether the degree of dystrophin increase as detected by western blot and immunohistochemistry were sufficient to have a physiological effect on DMD boys. With the DMD science community still debating this subject, Sarepta had no answer. In the above, less change in the 6-Minute Walk Distance is better; those with red arrows have the best performance. While no threshold dystrophin level is currently known as a requirement for improvement in DMD, this graph calls into question a lack of randomness in patient selection. The two high performers with lower dystrophin may simply be healthier than others. Missed in this argument is eteplirsen can and does lead to significant de novo dystrophin production to a level overlapping with that found in Becker’s. This is a major find in and of itself- no other drug has produced functional dystrophin in humans. Perhaps not all boys achieve the same level of benefit, but some certainly do. Repeatedly saying eteplirsen only increases dystrophin to 0.9% of normal is simply wrong. This issue is a major point of contention. Going back a step, the 201/202 trial is a prospective, uncontrolled, open label study, making it prone to errors, particularly through bias. Historical controls may be misleading due to differences in patient population, treatment, or other factors. Comparison to multiple historical controls help alleviate some of this. A matched historical control, under these circumstances, is the best possible option. 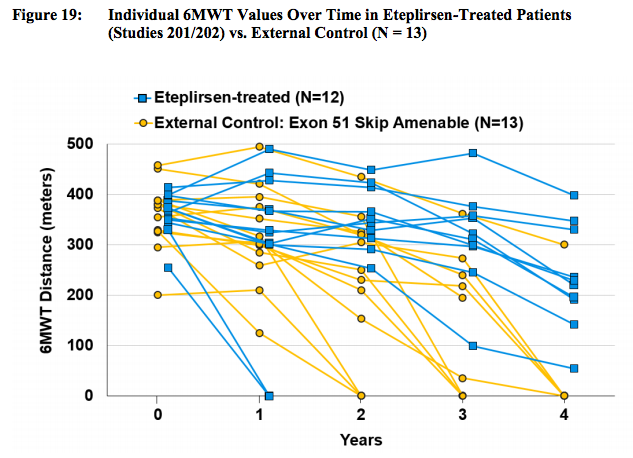 These graphs appear to show a clear difference in 6MWD trajectory for eteplirsen treated patients relative to control. 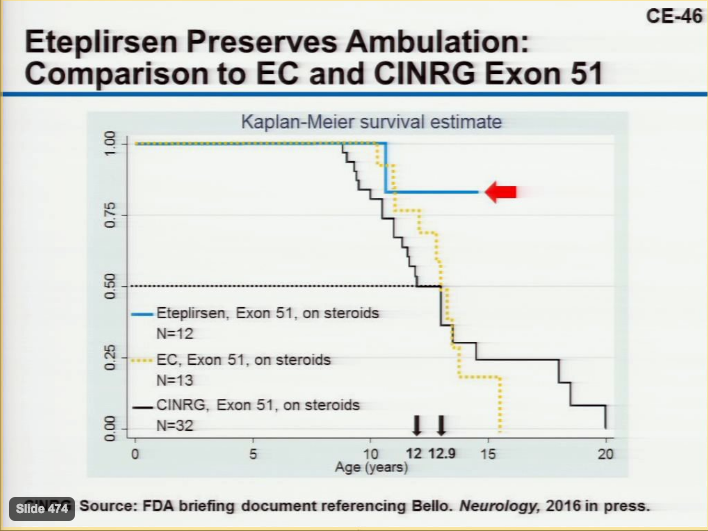 Rather than focusing on the clear group of eteplirsen treated patients who outperform all others, FDA focuses on one or two control patients with relatively high scores at their age. 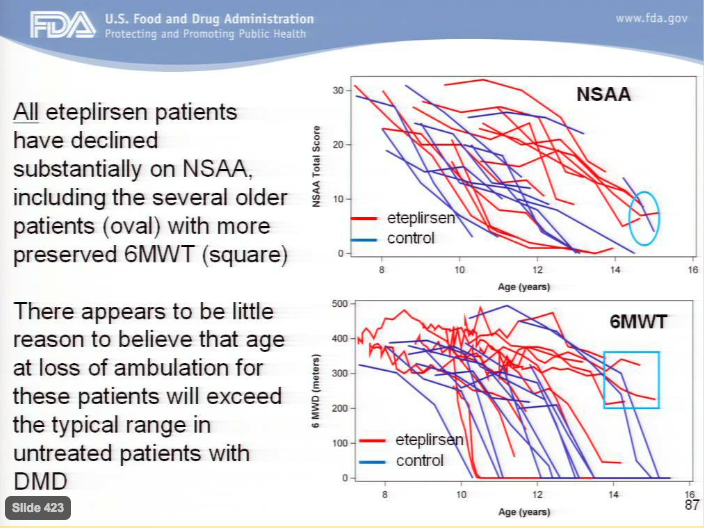 Missing the forest for the trees, FDA fails to see an entire forward shift in the Eteplirsen treated population. 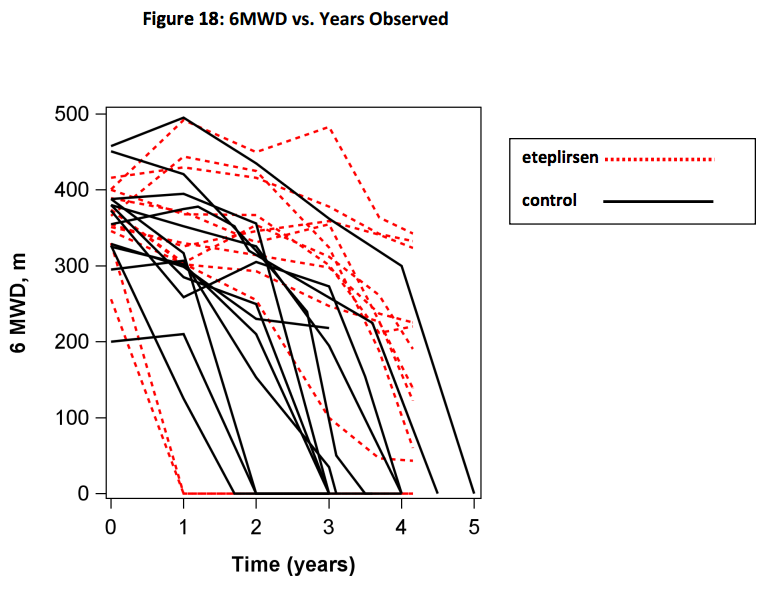 Picking at the FDA data, it is notable the two controls (blue lines) with longest time before loss of ambulation had the two highest 6MWD scores, indicating a steeper decline than eteplirsen. This slide was altered by Dr. Mendall to include eteplirsen and external matched control boys along with a simple statistic: median time to Loss of Ambulation (LOA). Median time to LOA is 12 for CINRG, 12.9 for External Controls (EC), and not yet reached for Eteplirsen. FDA has suggested some Eteplirsen boys may be close to losing ambulation in the near future based on NSAA scores. Even under this assumption the overall picture is unchanged; eteplirsen leads to a beneficial shift in time to Loss of Ambulation. Eteplirsen treatment leads to de novo dystrophin production, reaching 2% to 2.5% of normal in some patients, levels found in milder BMD disease. This novel dystrophin has been confirmed by western blot, immunohistochemistry, and RT-PCR. The sample size is small, but durability of effect and large divergence in performance of functional tests from external controls is convincing that superiority is not due entirely to chance or other factors. 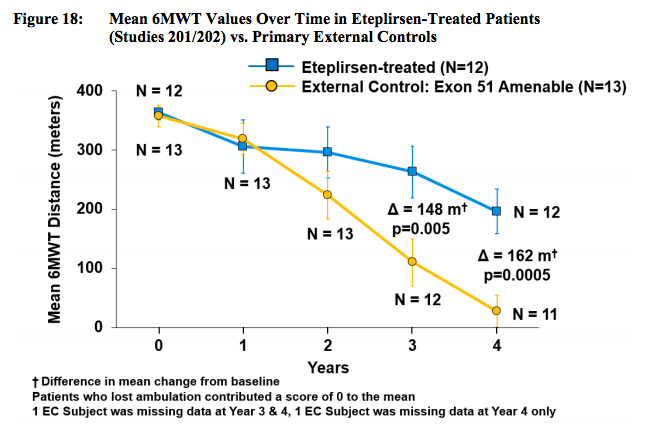 There is reasonable evidence to conclude Eteplirsen is an efficacious drug.